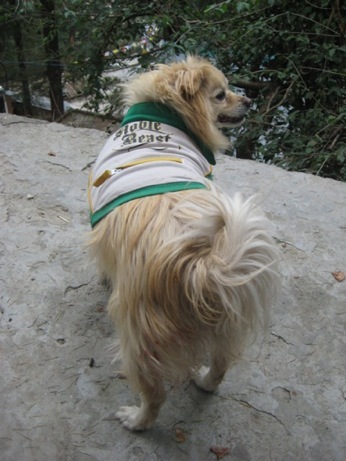 When I lived in Dharamsala India, my landlord had a charming Tibetan spaniel named Jojo. 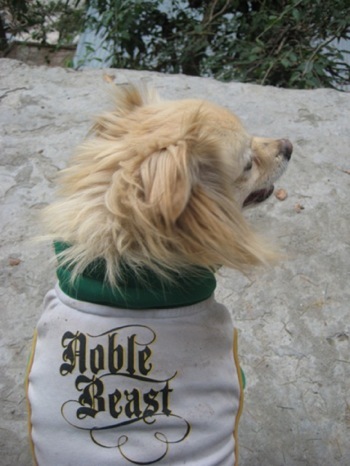 He was a fierce little guard dog and could bark and nip a ankle enough to make any prowler think twice! I didn't have a doorbell at my house but I certainly didn't need one with this sweet tiny beast around. Once we knew each other, a strong loving bond developed. For strangers though, the one foot terror was scary enough to make large men run away! 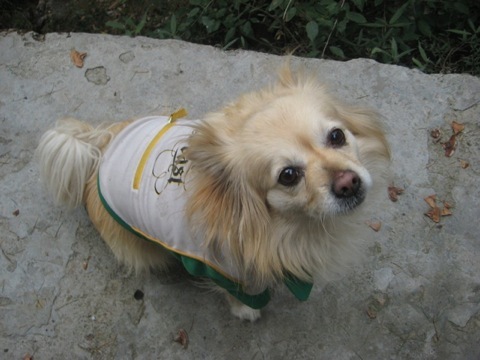 Originating in palaces and monasteries in Tibet, and across the border in China, these little Tibetan spaniel dogs were mainly used as watchdogs, patrolling the high walls of the monasteries in the Himalayas mountains. They were also regarded by the monks as ideal little companions and would often be seen around the monasteries, although the stories often told of them being used to power prayer wheels are probably just a myth! Tibet and China were not often visited by foreigners until the 19th century so it was not until the late 1890s that Tibetan Spaniels were introduced to Europe. They subsequently made it to the USA in the 1960s. Tibbies, as they are affectionately known, make excellent guard dogs, having very good eyesight and hearing. They will bark to give early warning to their owner of the presence of visitors, or anything else that is out of routine. Tibbies come in a range of colors including black & tan, sable, white, red and black. When fully grown they should weigh between 9 lbs and 15 lbs and stand about 10 inches tall at the shoulder. They are healthy and hearty little dogs and will live for 15 or more years, given a good balanced diet, proper health care, and regular exercise. Sweet little Jojo, the one foot high terror. Do you have a Tibetan dog story or business? Tibetan Spaniels need daily brushing to prevent their coat from becoming matted and to minimize the shedding of hair. In addition, they will require a full grooming every 4 to 6 weeks, including a bath with a gentle dog shampoo. Regular bathing will help to keep the coat in full condition as well as generally keeping it clean. Grooming Tibbies is the same as any other double-coated breed: You need to brush out the coat with a slicker or pin brush to remove loose hair that can otherwise become tangled with the woolly undercoat. The grooming session is also a good time to check nails and trim them if necessary. Tibetan Spaniels, like many other toy breeds, need almost constant human companionship - they suffer easily from separation anxiety. So if everyone in the household is out most of the day, this is not a suitable breed - the Tibbie should not be left alone for more than a few hours, and even then, not on a regular basis. And as far as exercise is concerned, being a small dog, they do not need to be walked for miles every day - a few short walks is sufficient. If you are looking for a companion that will be equally happy to go for walk, play with a ball, or snuggle up to you on the couch, a Tibetan Spaniel may be just right for you. And the care and attention that these lovable little dogs need will be amply repaid by their devotion to you. Due to the great demand for these special and loving dogs there are many Tibetan spaniel breeders these days. You can find puppies for sale or in tibetan spaniel rescue places you can adopt a dog that needs a home. Just google to find the one closest to you. Grooming your dog is not just to keep him looking good - it is also necessary for his health. An ungroomed dog is more likely to get sick, smell bad, get parasites, and suffer from periodontal problems. The most important aspects of home grooming are daily brushing and a regular bath. Tibbies have a double coat that is of medium length and is very soft and silky to the touch. To keep this in tip-top condition, and knot-free, requires careful attention by the owner. Daily brushing is essential and a full grooming session should be planned for every month. The daily grooming will be done with a pin brush, slicker or specialist comb (all available from the better pet stores and catalogs). This brushing will remove cotters and tangles before they build up to cause a serious problem. Knots, particularly under the arms and behind the ears can become very painful if left to build up. When doing a more extensive grooming, it is important to make sure that you get the undercoat thoroughly brushed out as well as the top coat. If you don't, you run the risk of it getting matted when it is soaked in the bath. When bathing your dog, it is easiest if you put him in a bathtub with an anti-slip mat in it to avoid him slipping about. This makes him easier to handle, as well as limiting the possibility of him slipping and getting hurt. Most dogs are not very keen on being bathed! It is important to recognize this and to talk to him in a soothing voice to keep him calm. If he still gets agitated, try putting him on a leash. The bathing should be carried out using a gentle, purpose made dog shampoo. These are specially formulated to maintain the hair in good condition and keep it shiny, without stripping out the natural oils. While bathing your dog, pay particular attention to the area around the eyes. Tibbies, like many small dogs, have a tendency to have the lower area of their eyes wet. If so, they need careful cleaning otherwise the area will stain. It is sometimes necessary to trim the hair away from the eyes, but this is best left to a professional. Bath-time is also a good opportunity to check for any ticks that you may have missed during the daily brushing sessions. If you live in a town this is not likely to be a problem, but if he is walking in a park, or the countryside, ticks are a persistent problem in many parts of the country. They also carry serious diseases that as well as making your dog ill, can sometimes be transmitted to humans. Before getting started with the bath, you must first get to work on his coat.The first thing to tackle is untangling any knotted hair. Start out by brushing your dog with a hard comb being careful not to hurt him. It's best to use a quick, but not hard movement - see if you can watch a professional at work to see how they do it, or ask your breeder for a demonstration. If knots are difficult to remove, special combs are available to help with the most difficult parts. The important thing is to keep your dog calm and make sure that he doesn't get either hurt or distressed. If he does, he will remember that next time you go to groom him, and it will make him more difficult to handle. While you're grooming your dog, you should check his nails to see if they need trimming. You should ask your breeder how to do this - it's much easier to see it demonstrated than to describe it! You will also want to check his teeth to see if they need cleaning. It's a good idea to brush them regularly anyway, and to have your veterinarian clean them professionally every couple of years. If you practise these basic grooming techniques they will not take you long to master and will then only take a few minutes each day, but the effect on your dog will be noticeable. He will look and smell good, and be more likely to stay healthy, as well as being less likely to leave a trail of hair wherever he goes! Do you have a story, business, question or information about Tibetan dogs? Just fill in the form below to share, it's easy!